My relationship with writing has always been controversial. First of all because I can hardly bear the physical inactivity that writing implies. To sit at a desk in front a computer monitor for months, maybe while outside the sun is shining and there are ideal weather conditions for climbing or making a magical photograph makes me feel very badly. Secondly because introspection, and the feeling which comes from the emotions I wish to narrate have to be distilled from situations which at times brought me very near to death, or that were very hard anyway: the gap between the reality of those moments and the written page is not easy to fill. In spite of this, I was able to find the energy and the key to give voice to my experiences, and at the end my books have seen the light one after the other with surprising spontaneousness. My first book, Montagne con la Vetta, published by Vivalda in 1998, tells the stories of my climbing in Himalaya and took me seven years of preparation during which I had been taking down notes while I was on my expeditions. One immense gratification from this book is the foreword written by Walter Bonatti. Bonatti has always been my reference point in climbing and my dreams as a boy took shape by reading his I Giorni Grandi. Bonatti is the man who more than anyone else, with his achievements and, above all, his ethics, has embodied the figure of classical climber I identify myself completely with. The day he accepted to write the preface to my book was one of the most memorable days in my life. 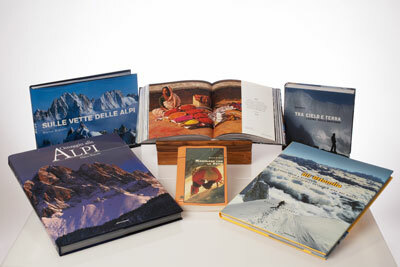 The beginning of a new vision with the photographic medium gave birth to my second book, Omaggio alle Alpi (2001), published by Mondadori and then in France by Glénat with the title Les Plus Beaux Sommets des Alpes. With my Linhof 4×5″ I hiked in every corner of the Alps for three years, from Dauphiné to the Grossglockner, with the aim to capture the spirit of the most grandiose mountain chain of Europe. It was an immense task that required all my energies. This book marked the beginning of my collaboration with Mondadori and the esteem that the greatest Italian publisher always expressed for me is something I am very proud of. And when Sir Edmund Hillary, the first mountaineer to conquer the Everest and one of the world’s most legendary figures of climbing accepted to write a preface to my book was one of the greatest days in my life. After the very good result of Omaggio alle Alpi, with Mondadori I worked at Gli Ottomila, published in 2002. This is an illustrated book about the fourteen highest peaks of the world. Once again I was honoured to have the book prefaced by one of the greatest personalities of climbing of all times: Riccardo Cassin. This book is a complete journey through Himalaya and Karakorum and also tells about the people who live in these regions. Gli Ottomila was then published in Austria and Germany by Tyrolia with the title Die 8000er,in Spain by Everest with the title Los Ochomiles and in France by National Geographic with the title La magie des huit mille. Such a success in the publishing field was beyond any of my expectations. In 2004 I published, again with Mondadori, Sulle Vette delle Alpi, a book aiming to guide hikers and mountain lovers to the discovery of the Alps, from Monviso to the Dolomites, by the graphic illustration of many of the most popular alpine routes and the actual identification and naming of the single peaks, ridges, spures and gorges. An unusual version of geographic map accompanied by the stories of the protagonists of the great climbing ventures on the individual mountains and on the specific alpine routes. My friend Roberto Mantovani, journalist and historian specialised in mountaineering, is the author of an inspired and intense preface. Besides Italy, this book was published in Poland by Muza-Bellona with the title Na Szczytach Alp. In the end, Tra Cielo e Terra, published in 2005 again by Mondadori. This is a book created with a different spirit, written in a much more intimate and personal tone, where I tried to recreate the emotions, the feelings, the torments and the exaltation I felt when I was living my adventures on the mountains.